Husband passed away will be getting 1 every year from now on. The little bear is just what I wanted. 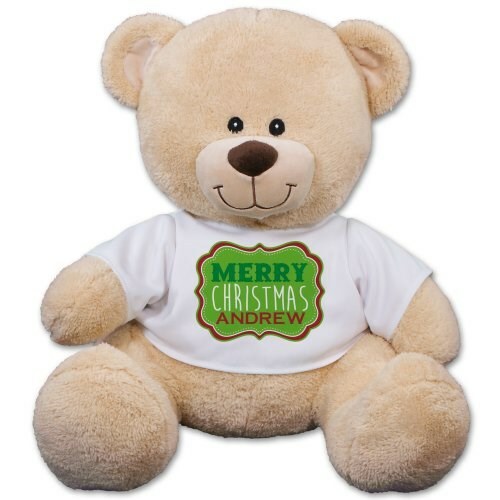 Celebrate this glorious season and wish everyone the happiest Christmas with our plush teddy bear! Our Merry Christmas Teddy Bear makes an excellent addition to the holidays. This holiday design is available on our Sherman teddy bear. Sherman is offered in three different sizes. Please choose from our 11 inch, 17 inch or our 21 inch teddy bear. Free gift wrapping and a free gift message are included to create a thoughtful presentation. Free personalization of any name is included. Additional Details Be sure to check out all of our Christmas bears to find the perfect holiday gift!